Lewis Allen, Alvin Nederlander Associates Inc., The John F. Kennedy Center for Performing Arts, Icarus Productions. Based on "Little Orphan Annie" (R) by permission of the Tribune Media Services Inc.
including the Broadway smash hit, ?Tomorrow?. THE Garrick Playhouse is full of excitement as people wait to see their favourite musical and the theatre?s last production of the year, Annie. The story about the orphan who rises from rags to riches is full of warmth and the triumph of the human spirit over adversity. The director, Joseph Meighan, his superb adult cast and a host of little girls, not to mention a dog, win round the audience immediately. The dog, the younger brother of the original dog who was ill, took his bow, or should I say bow-wow, by launching himself off the stage practically into my husband?s lap! The choice of 12-year-old Caitlin Reeves as Annie is inspired. She is naively optimistic about finding her parents and keeps the other kids happy, especially nine-year-old Alice Cross who plays little Molly who misses her mummy. Caitlin can dance, and sing songs like Tomorrow with perfect diction and feeling. Her saviour, Oliver Warbucks, is played by charismatic Richard Sails. His attraction to his PA Grace Farrell (Sasha Carrillo de Albornoz), when they dance, is clear. All these lovely people would be boring if there wasn?t a wicked one. That comes from child hating, self-loving, gin swilling Miss Hannigan. She?s a witch in the hands of Laura Aremia who adds humour to the role. Both the adult and junior choruses sing well and, thanks to choreographer, Alexandra Howarth, are well positioned, excellent dancers, too. 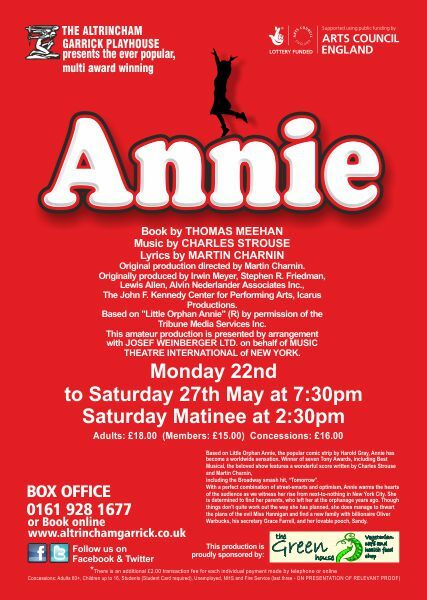 Anna is at Altrincham Garrick Playhouse until May 27. Tickets priced from 0161 928 1677. This amateur production is presented by arrangement?with JOSEF WEINBERGER LTD. on behalf of MUSIC?THEATRE INTERNATIONAL of NEW YORK.